An easy way to find your store URL is to navigate to your store in your browser, then simply copy the web address from your address bar. Also, your store ID was provided to you when you first signed up, so you can look at your documentation. If you are unsure, you can just type "I don't know" and we will get it for you. Drive more traffic, get more sales, make more money! As an entry-level solution with a lower monthly fee, your cost-per-click is a little higher so you don't get as much traffic as the other plans but it is still an effective solution for most situations and a perfect way to get started with online marketing. With a higher monthly budget, you are able to leverage greater buying power which helps drive much more traffic to your web store. 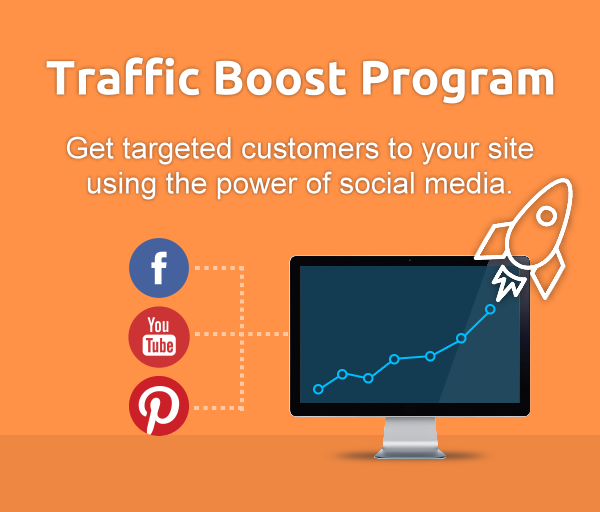 While this package is less than twice as expensive than the Starter Package, it produces a whopping 125% MORE traffic. It's a great value! Download the complete Program Details It includes everything you need to know, has the answers to our most frequently asked questions, and much more. By submitting this form, I agree that my credit card will be automatically billed monthly. I also understand that this is a 3 month minimum service agreement. An early cancellation fee of $49 is due if I cancel prior to 3 full months of service. Our team consists of highly qualified digital experts. From design to marketing we do it all!